Nearly thirty years after his parents were murdered, Nehemiah, now a cup-bearer for King Artaxerxes, is visited by his younger brother. Nehemiah learns that the cities walls of his hometown are in shambles and the people are suffering to survive the famine and high taxes placed upon them by wealthy landowners. With this information, Nehemiah feels compelled by God to return home to Jerusalem to rebuild the wall. Chana, a young woman whose fiance was killed because of the lack of security in Jerusalem, feels pressure to accept the advances of a wealthy vineyard owner, Malkijah, to free her younger sisters to marry. When her father volunteers to help with the rebuilding of the wall, Chana insists on helping, hoping to rebuild her faith and heal from the past. Nava works with her family on a small piece of land, but with the famine, her father doesn’t have enough money to repay the landowner, Malkijah. Though she wants nothing more than to marry her sweetheart, Dan, when Malkijah asks for payment, Nava agrees to go with him as his bondservant for six years to repay the debt. While missing her family and Dan, trouble follows Nava when Malkijah’s mischievous son begins to follow her around the vineyard. Many oppose the rebuilding of the wall, especially local politicians who view the positive attention Nehemiah receives as a threat to their own political agendas. As these men attempt to thwart the project, all are challenged to have faith and trust, in God and in each other. With great historical detail, Austin tells the story of Nehemiah and the rebuilding of the wall around Jerusalem. There is so much insight into the building procedure and ancient tradition, especially in regard to the Torah. The characters come alive in this well-researched, and well-imagined world, as do their struggles. Despite the length, the story remains fairly fast-paced throughout as the characters’ struggles and storylines overlap. The narrative switches between multiple perspectives which also makes it an engaging read. In addition, though this book is third in Austin’s The Restoration Chronicles Series, I had no difficulty picking up where this story began and getting to know the characters. While I liked the switch between different characters’ perspectives, some of the characters emerged at the end of the story a bit underdeveloped, simply because there wasn’t much time to spend with each character. Tension built throughout the story as different politicians, attacks, and unforeseen circumstances threatened the building of the wall. In the end, the story fizzled out a bit, in my opinion. There are certainly historical restraints, but I hoped that a story with so much buildup would end with more gusto. On This Foundation was an engrossing read full of interesting storylines and history. Despite the ending, it’s a great Biblical story that teaches the importance of trusting in God at all times. 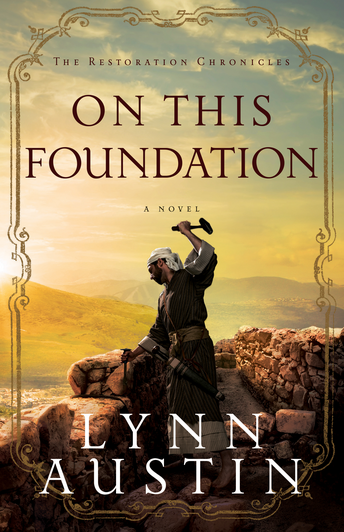 Get your copy of Lynn Austin’s On This Foundation at Bethany House or your local library.